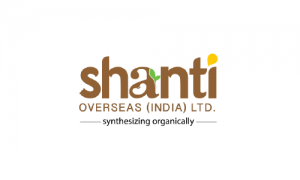 Shanti Overseas is engaged in manufacturing of soya products which includes, soya de-oiled cakes (soya meal), soya crude oil, degummed oil and soya lecithin, and is also into primary processing and trading of agri commodities such as chickpeas, soyabeans, cracked corn, maize, yellow peas, pulses etc. At present, its operations relating to primary processing of agri-commodities are carried from the unit – I situated at Palda, Dist. Indore, and manufacturing operations of soya bean products are being carried from Unit - II situated at Sonvai, Dist. Indore. In Unit-II, it carries seed processing and oil extraction activities of soyabeen seeds through a mechanical process, which results in production of organic soyameal and organic soya crude oil. The company is in process of setting up a processing plant in the area of Dhannad, dist. Indore, for production of edible partially deffated organic Soya Flour, textured Soy Protein, expeller pressed physical refined oil and Organic Soya Lecithin. It has already acquired the land and started building construction work on the said land. Further, after the construction of proposed manufacturing facility, the company intends to shift its all operations carried from Unit II to the proposed Unit in Dhannad. Presently, both Unit I and Unit II are taken on rent. It derives major source of revenue from the exports of soya products and agri-commodities. In F.Y. 2016-17, exports constituted over 75% of Shanti Overseas’ total revenue from operations. It markets garbanzo bean (kabuli chana) primarily under its registered brand name “Kitchen Pride”. Major foreign countries to which its product are exported include USA, Canada, Turkey, Dubai, Pakistan, Sri Lanka, Spain etc. Shanti Overseas IPO allotment status is now available on Link Intime’s website. Click on this link to get allotment status. Nice, I like this company. Good growth and not expensive. It will give good returns. I do not understand. WHat is good with the numbers that you see? whats your opinion on tis ipo?